Just across the highway lanes from Expressway Toyota, stands a true Boston landmark – the Rainbow Swash. The Rainbow Swash is a work by Corita Kent painted on a 140-foot tall LNG storage tank in the Dorchester neighborhood of Boston. It has been said to be the largest copyrighted work of art in the world. Highly visible to thousands of daily commuters on the expressway I-93, the Rainbow Swash is considered one of the major landmarks of Boston, akin to the Citgo sign in the Fenway neighborhood. 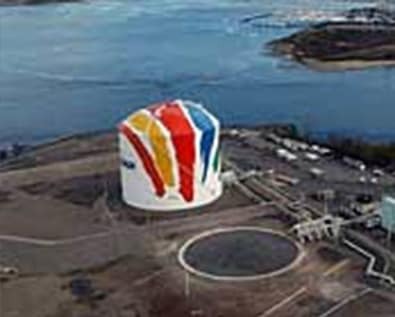 In 1971, then-Boston Gas Company president Eli Goldston commissioned Corita Kent to paint the Rainbow Swash design on one of two adjacent LNG tanks facing Boston’s Southeast Expressway. The original design was painted on an 8-inch scale model, before twenty painters reproduced the work on the 140-foot high tank. Since the 1970s, the stripes of the Rainbow Swash have been linked to certain figures – both historical and fictional. The mural was initially said to have featured a profile of Vietnamese leader Ho Chi Minh’s face in its blue stripe. Corita Kent was a known peace activist and some believe she was protesting the Vietnam War, but Kent herself always denied embedding such a profile. Less controversially, the yellow stripe has been said to resemble the profile of Fred Flintstone looking southward – although, that may be attributed more to the imaginative young minds of school children on passing busses, and less to artist intent. 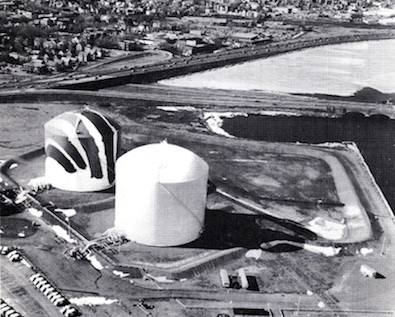 In 1992, the original rainbow-painted LNG tank was torn down and the Rainbow Swash was recreated on the adjacent tank. 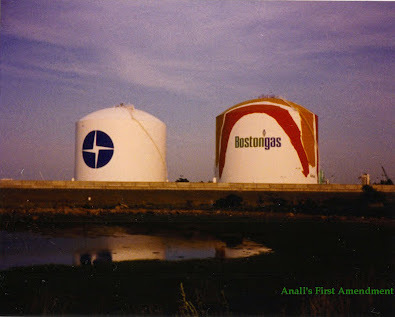 In 2000, Boston Gas was acquired by Keyspan and the Keyspan logo replaced the Boston Gas logo under the rainbow. Keyspan was then acquired by National Grid in 2007, and the National Grid logo replaced the Keyspan logo shortly after. This is how it remains today. The Rainbow Swash has been featured in many films, among them 2005’s Fever Pitch.